You can optionally add fresh ground pepper and some parsley too. ground it all up with mortar and pestle to pasty consistency(sticks well to pasta). Mix well with steaming pasta. Of course a mortar and pestle would be ridiculous to use when we all have cheap Chinese made gadgets. I use a stick blender, most commonly used is a food processor.This will be delicious but how does it satisfy the meets peasant food meets locally produced food matrix? For a simpler matrix we will say all the ingredients are haute cuisine leave that out. The whole world is going broke, so I figure start living like a peasant, then as the worldwide economy continues its downward spiral and catches up to you(if it hasn't already), you will already be living like a peasant, so no big deal. Peasant Food can be quite good and if you have a couple good meals a day, how bad could things be? If local food is marketing to well off people more than about changing the culture of food I am less sanguine. 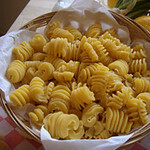 It may be local in Italy, but it isn't here and it costs about $20 per pound! The subtle flavors of Parmesan get lost among the strong flavors of garlic and basil anyways. Any inexpensive white cheese like mozzarella or Monterey Jack will satisfyingly impart the flavor, texture and mouthfeel of cheese and add some salt to the pesto to improve the flavor. We have some local artisan cheese makers. You can get hard goat cheese, in the Parmesan style at the Bend Farmer's Market. Made in China. Need I say more. The most expensive nut in the world. Mediterranean Pine Nuts cost $35 a pound and the Chinese ones are close to $20. In Italy they commonally use walnuts too in Pesto. Walnuts make a great tasting pesto. They are no worse than Pine Nuts, just different. Now that Fields Farm is selling Oregon Tilth certified organic walnuts this a no brainer. Switching to the more reasonable and equally worthy Walnut, I have not bought pine nuts in a few years, but when I did I was not about to mash such a pricey item up to get lost within the other strong flavors. I'd sprinkle them on top. Olive Oil is anything but local. A major worldwide commodity, subject to the marketing sleights of hand such as "Packed In Italy " prominent on the front label while "Contains oils from Spain, Greece and Italy" on the back only visible with a magnifier. I suspect Olive Oil is somewhere between fantasies of it and Fukishima cooling pool liquid. A recent investigation of another worldwide food commodity, Honey, revealed that the Honey sold in Big Box stores is not even identifiable as such being that it is missing part or all of its unique fingerprint of pollen. Trader Joes was the only local Box store to have real Honey. You can get 3 of the 5 ingredients for pesto from Fields Farm. That is why it occurred to me to write this. If you are a local food purist, you have to do this somehow without Olive Oil. Otherwise to make this an affordable everyday food use mass market cheese. For more authenticity and quality you can use a local craft hard cheese. Use local walnuts. RadiatoreRadiatore Pasta is great for Pesto. The Pesto gets stuck in all those little fins.Pesto is also a great pizza topping, add it after cooking and forget the cheese since its already on the Pizza, just plop it on I have been unsuccessful try to apply it gracefully with a squirt bottle. You would have to thin it with a lot more olive oil and that would change the taste. I had a pizza the other night with pesto, sliced eggplant and anchovies.Serve Pesto-Pasta with a piece of chicken, pork chop or tuna or salmon steak simply with some kosher salt sprinkled on and a lemon wedge to squeeze on it, a salad and a bottle of crisp white wine.Cilantro Pesto. I had a glut of cilantro so I experimented. As with the arugula pesto I tried the difference was more subtle than I expected. The herb or green in Pesto is only one part of it. That being said there nothing better than basil for pesto and nothing better than cilantro for salsa(I have tried basil in salsa too!). We have Wild Rice from Debbie's brother, Mark Running. He grows wild rice in the Sprague River valley and outside of Brownsville in the Willamette valley. The wild rice is grown is a grassy marsh ecosystem using a series of ponds which both naturally fertilize the rice as well as providing a rich habitat for migrating waterfowl. In a medium saucepan, bring all ingredients to a boil. Reduce heat to low and cover for approximately 1 hour. Makes 2+ cups cooked rice. If using a bread machine, select 2-pound loaf size. Add ingredients to the machine according to the mfg. directions. If available, select the whole grain cycle. Mix all ingredients well...serve with grilled chicken or tortilla chips! In a large bowl, mix the wild/brown rice, cheese, soup, onion, 2 tablespoons melted butter, salt, pepper, and sour cream. Transfer rice mixture to 8x8 baking dish. In a small bowl, mix the dry stuffing and remaining 2 tablespoons melted butter. Spread stuffing over potatoes. Bake at 350 degrees for 35-40 minutes. This recipe can be easily doubled. Soak porcini for 5 minutes in ½ cup boiling water. Score and scoop out some of the extra flesh from the length of the squash (this creates a well for the rice mixture). Finely chop squash and add to frying pan with olive oil, onion, garlic, coriander, rosemary, and sun-dried tomatoes. Cook until softened approximately 5 minutes. Add the porcini and half their soaking water. Cook for another 2 minutes. Add salt and pepper. Stir in cooked rice and pine nuts. Pack the mixture tightly into the 2 halves of the squash and press together (put the squash back together). Rub the skin of the squash with some olive oil, wrap in foil, and bake for 1 hour and 15 minutes…a fork should easily push through squash. Bring wild rice and bullion to boil. Cover and reduce heat to low for 1 hour. In a large bowl, mix the rice and the remaining ingredients. Pour dressing (below) and mix. Serve warm or chilled. The Kohlrabi with sage I wrote about previously, I liked so much, I realize, because it tasted so much like Thanksgiving stuffing. You can never make enough stuffing because you are limited to what fits inside the Turkey cavity. I never liked cooking extra in a casserole dish, it never comes out the same or as good. This year I will experiment with Kohlrabi with sage on Thanksgiving. I will try mixing with the stuffing or serving it alongside. 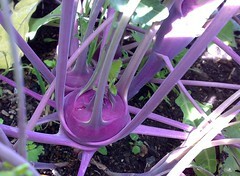 Jim will be planting a late crop of Kohlrabi to be available for Thanksgiving. It is definitely something to incorporate into the Thanksgiving menu. The versatility of Kohlrabi was evident when instead of using sage, I used basil. I made pesto the way I normally do, only I pureed it with Kohlrabi and ate it sans pasta. Just as the Kohlrabi ably replaced the breading, it did not leave me wanting pasta and it was delicous. Jeremy, the Fields Farm intern, tells me he shreds Kohlrabi raw with carrots and it makes it a great coleslaw. Not turning on the stove is a great idea since it has been over 90 degrees everyday. The peak of season hitting at the Farmer's Market and the hot weather makes for "Salad Days". If you need some ideas check out 101 Simple Salads for the Season. Click the "Single Page" link and do a page search(usually ctrl + f) for the ingredients you have on hand. Since I did this website for Fields Farm, Jim and Debbie are nice enough to kick me down some of the Fields Farm cornucopia. When they offered me some Kohlrabi, I confessed that I had never tried it before. Kohlrabi seems only to be introduced to the US food supply by the Farmer's Market/Organic Foods movement, Mom didn't cook it when I was growing up unless it was in one of those Hamburger Helper packages. I was struck by the appearance of the phosphorescent purple orb with symmetrical tentacles coming out of it from all directions. It looked like something that you would find on the cover of a Yes album. Debbie told me you cut it up and cook it like any other vegetable. Kohlrabi has been compared to broccoli stems in that it absorbs the flavors of what you cook it with, turnips in that it is a bulbous shape and you can eat the greens and to eggplant in that its purple on the outside, white on the inside, roundish and you have to cook it to soften it up. But those comparisons are not even as close as saying a mango is like a peach or any exotic meat tastes like chicken, Kohlrabi is pretty unique. At the Farmer's Market yesterday I asked Jim why he does Kohlrabi. He said it is beautiful and that it loves the cold. It can grow in the spring and in the fall here and won't suffer with our inevitable frosts. I got a couple of more Kohlrabi to stuff in my panniers and take home with me. Meanwhile going on simultaneously and coincidentally Debbie puts a Kohlrabi recipe up on the site. I discover it when I get home and try it out for dinner. It is probably obvious that I have been searching Kohlrabi, and one thing I found went on ecstatically about pureed Kohlrabi. Debbie's recipe didn't mention that, but it was the same basic idea. So I diced up a Kohlrabi, fried it up with a head of the young garlic that I recently got from Fields Farm, in a good amount of olive oil and some salt and pepper. I had some fresh sage that I got from the Farmer's Market. I love sage, but sometimes it is hard to figure out what to cook with it--I think I had a match here. I grabbed a bunch of leaves, threw it in and pureed it. I was too lazy to bake like the recipe said, so I just grated some cheese on top of it. That was fine and it was steamy enough to melt the cheese. Wow. It was incredible. I finished eating it all up before I touched anything else on my plate! In the impetus these days for local food, I think maybe Kohlrabi can be something significant in the Northwest cuisine. For instance a basic technique in cooking is using a mirepoix. Mirepoix is a finely diced mixture of onions, carrots and celery that is a base for sauces and other foods. It is a french technique but is also a part of elemental foods such as Bolognese Pasta Sauce. Celery takes 5 months to grow and is very sensative to frost. Guess what? that means you cannot grow it here. I hereby propose that for the Northwest Mirepoix we replace the celery with Kohlrabi! I will be eager to try this variant of Mirepoix out as well as other ways to cook up some Kohlrabi. Delicious Kohlrabi and easy too! Grate or chop finely 2 Kohlrabis. Saute with 2 gloves of minced garlic in your favorite oil until tender. Cover with 2 to 3 tbsp. grated parmesan cheese. Pop in the oven at 350 til cheese is brown. Makes 2 large servings or 4 small. Hi, I am Dale the webmaster of FieldsFarm.org. In addition to being able to put together some computer code, I also like to think I can put together some foodstuffs to delicious result. Like all good chefs, I don't look at the recipe and get the food, I get the fresh, quality food that is available and then make up the recipe. From Fields Farm I got some baby carrots, kale and garlic curls. I also picked up some cherry tomatoes at the Farmer's Market. I started by cooking up some Bulgur. Bulgur is a wheat grain food common in the Middle East, Mediterranean and India. It is not even packaged anywhere that I know of, but in the markets that have bulk bins, it can usually be found. You can substitute it for rice--though maybe not when you are making sushi! It cooks exactly like white rice. I put 2 cups in a saucepan with some oil and a couple pinches of salt and fry it for a couple of minutes. I then add 4 cups of water. After it comes to a boil, I simmer it for 14 minutes. Though it cooks like white rice, it tases more like brown rice--only a lot better! It has a nutty whole-grainy taste and a unique texture that is rough but in a very pleasing way. I figured this would be a good match for the kale. I cut a few carrots into wedges and sauteed them in some olive oil. After awhile I threw in the curls, which I had roughly chopped(don't cook the skinny tips, they will burn, just throw them in raw at the end.). When it all was carmelized with nice brown burn marks, I turned off the burner and tossed in the Kale, which I had also roughly chopped. After a couple of minutes I mixed it all on a plate with an equal amount of Bulgur, drizzled a good amount of olive oil and balsamic vinegar on it and topped with the cherry tomatoes. The rest of meal consisted of bbq chicken and a couple of big glasses of cheap, acidy Australian Chardonnay that could stand up all of this. With such a good salad, I can't leave you hanging without the recipe for bbq sauce. If I left you to your own devices you might come up with something than was not worthy. That would dishoner the Bulgar Salad! Start with a store bought bbq sauce. Find one without crap in it like fructose, mono and diglycirides, etc. For 1 cup add 1 or 2 teaspoons each of red pepper flakes, crushed ginger, cumin, sesame seeds, sesame oil, soy sauce and fennel seeds. Cooking it helps even if it is just a minute in the microwave.